Questyle's killin' it with resolution and power. What if a manufacturer said they'd give you firsties at their new reference product? Questyle's QP1R portable digital audio player (DAP) follows a long line of excellent home and portable products. When I first saw, and heard, the QP1R in pre-production form I knew I'd want to be the first to review it. With an immense amount of innovation and a visual style that could rock the luxury goods market... count me in. 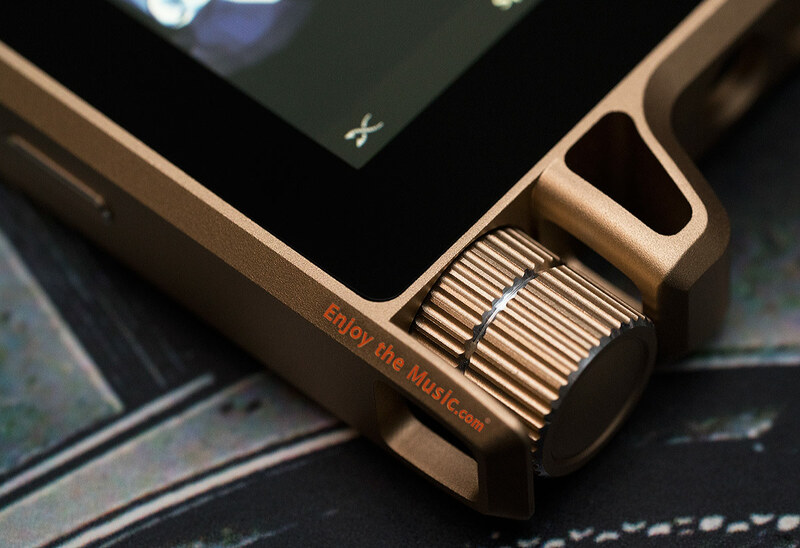 Will say here and now I hope Questyle releases the QP1R in limited edition rose gold version, as then it would become one of the most visually appealing personal audio players for those who desire fashionable devices that also encompass high quality. For those unfamiliar with just what makes the Questyle QP1R DAP so very special, read on. Questyle Audio designs and manufactures their high fidelity audio gear completely in-house. If they only made blenders and washing machines, then they'd be featured within the magazine Spin Cycle and not here on Enjoy the Music.com. The Questyle Audio family consists of Questyle Audio Technology Co. Ltd location in China and Questyle North America Inc. USA. All products are assembled at Foxconn, the same massive manufacturer in China that makes your Apple devices and too many others to list here. Just heard that Foxconn is seeking to build a gargantuan production facility in India to augment their massive China footprint, yet that info is probably more useful to those into investing rather than audiophile goodies. Questyle designs, engineers and oversees the construction of high resolution audio players including those for home use, battery powered portable audio devices (DAP), headphone amplifiers, wireless units, preamplifiers, power amplifiers, etc. Their continuing goal is supported by achieving high quality sound combined with product reliability and excellent customer service. Worldwide distribution plays a key part to Questyle's ongoing success. Of note is that Questyle Audio holds eight patents, including the worldwide PCT patent on Current Mode Amplification and 5GHz lossless high-resolution wireless audio transmission. 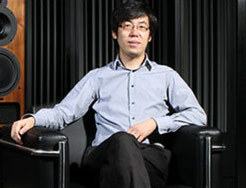 Wang Fengshuo (Jason Wang), founder and CEO of Questyle Audio, was deeply attracted to hi-fi audio as a seven year old, which is when he first listened to it. Eventually he bought all kinds of electronic components, picked up his soldering iron and tried every kind of circuit and device. When he went to university, Jason Wang chose to major in Electronic Engineering without hesitation. He was excited to have an advanced lab in which to experiment, a wonderful library to study in, and kind teachers to consult. After having thrown himself in for some time, he felt he had found that there were many defects within the traditional audio amplifier circuit that blocked his quest for true high fidelity sound. He kept on this way until we now have many products from Questyle. One of the unique aspects to Questyle's QP1R is that it uses special Current Mode Amplification. This system features the use of transistors to amplify, with a disaggregate structure designed in. To wit: voltage input and output, while the core amplification takes place in the current domain operating in a pure Class A state, and allowing the output stage (OPT) to be changed to either Class A or AB. Capacitance between the transistors, which affect the speed and bandwidth, operate at a very low impedance. This allows the full-power bandwidth of the entire amplifier loop to be very close to the bandwidth of a closed loop. The signal-to-noise grows linearly with input signals, together with a strong and speedy negative feedback loop (the speed of the circuit is reportedly hundreds of times faster than that of conventional voltage amplifiers). All these attributes are quite different from that of a traditional voltage amplifier. Questyle says that this not only eliminates the TIMD, it also easily achieves amplification with a wide bandwidth and ultra-low distortion. There are many other technical aspects of the Questyle including the way it handles DSD, yet after receiving many(!) pages of technical data, simply trying to post them all here would extend this review far beyond any normal length. Simply said, the Questyle QP1R encompasses many unique innovations to achieve what the company feels is the very best sound possible at this price level. Over the years having read thousands, perhaps 10,000+ technical manuals, and color me very impressed with the innovations within Questyle products. Their products are not just another technology rehash or me-too device. There are true innovations on a highly technical scale not found in virtually any other device. Bravo Questyle! Everyone who has entered the Foxconn facility knows that they do not allow cameras, camera phones, etc. Check them in before you're allowed into the main facility, and rest assured you will get it back safe and sound when you leave. Oh, and it takes more than a beautiful smile to get into the production facility. With that said, here are some photos of Questyle's production facility within Foxconn <VBG> (that's old-school BBS-speak for very big grin). 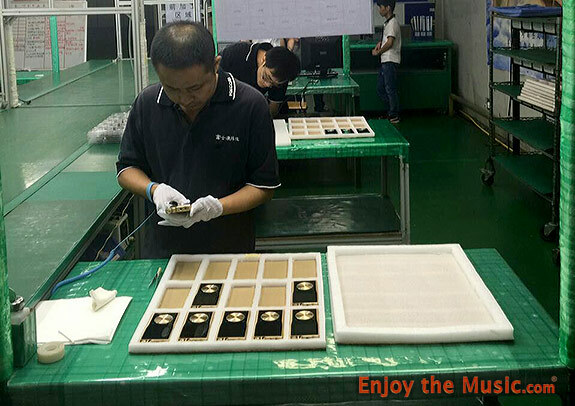 Foxconn carefully testing Questyle's QP1R before it is sent to final QC and packaging. 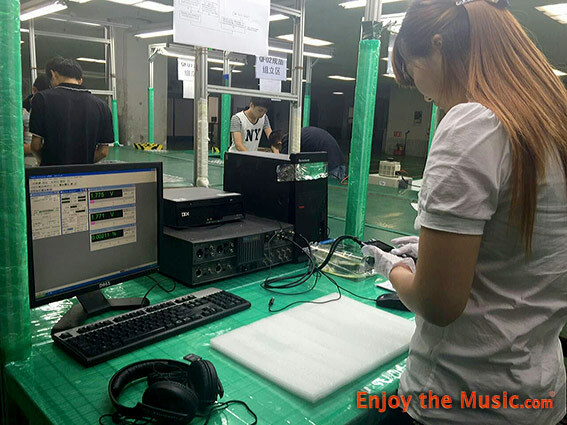 Foxconn doing a visual check and final testng of the Questyle QP1R. They are ensuring there are no defects in craftsmanship. 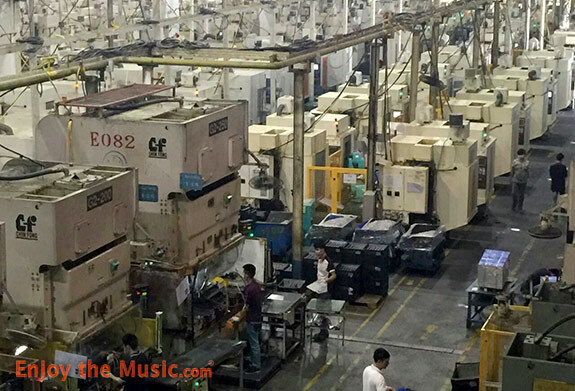 Foxconn's enormous CNC machines where the case's metalwork is completed. I could sum it up by saying that if you've ever used an Apple iPod or iTouch then you already know how to use the Questyle QP1R. In fact this unit is made by the same company within China that manufactures Apple products (Foxconn). 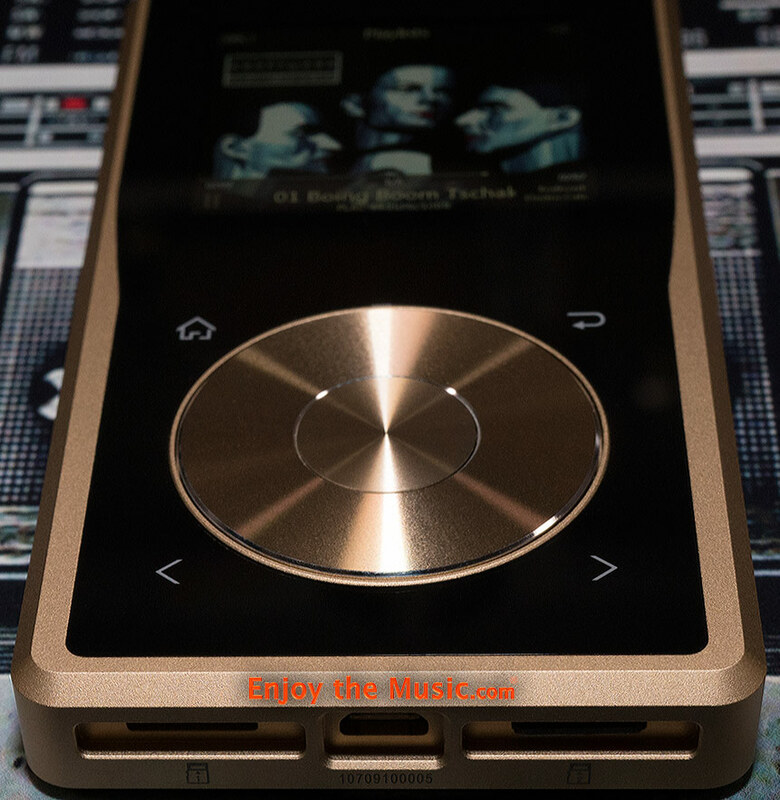 Thus Foxconn not only knows how to produce a high quality and reliable portable music player such as those from Apple, they also know the problems and how to make it more durable when a manufacturer is willing to invest more into the cost to design, engineer and overall build quality of said product. You do have to press down a bit on the scroll wheel to make selections on the graphical user interface (GUI), which I like as it keeps accidental and unwanted changes from taking place. The wheel works so smoothly that if you lightly move your finder in a circular motion I am almost not sure if my finger is touching a non-moving wheel or if indeed the wheel is turning as my finger moves. Smooth! It is only when you press down on the wheel with more pressure that you feel these small clicks that tactically confirm the wheel movement. The button within the center of the scroll wheel confirms your selection on the GUI. If the screen is off, you can push this center button to turn the screen back on. You can also use the long oval button on the side of the unit to turn on the screen or to turn the unit on or off completely. At the top of the Questyle QP1R is the beautifully made volume control and is always active when the unit is powered on. As you can see within the photo, there are protectors around the volume knob to avoid accidental movement and to protect it from clumsy types who tend to destroy knobs and anything that hangs outside of a main chassis (knobs, switched, vacuum tubes... you accident-prone types know who you are). To the left of the volume knob is air. Next to that are tachyons, which are moving so fast that humans can't see them, which are also surrounded by an adhering force of the universe which the human species does not fully comprehend how it works. Got it? Ok, I was just checking to make sure you're still paying attention <VBG>. To the left of the volume knob is a 3.5mm dual purpose line and optical output and to the far left is your standard 3.5mm stereo headphone jack (that's 1/8" to you Yanks, or 0.125" for USA-based engineers). The middle jack does doubles as an optical output and Questyle supplies an optical to TosLink adapter. 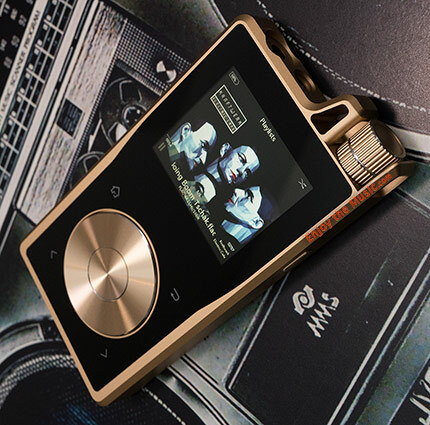 This way you can feed the music from the Questyle QP1R's optical output into an external DAC of your choosing. Getting back to the front of the unit, there are four touch sensitive buttons around the scroll wheel with your typical top left Home, top right Return/Back, lower left Back pointer and lower right Forward pointer. Do I really have to tell you what these touch-sensitive bits do? I mean, really? Ok, the Home one takes you home, where there's freshly baked from scratch chocolate chip cookies waiting for you (that's what my Muse and wife Heather just made; and don't they smell great too!). The other buttons, well, am sure you're already familiar with those by now...unless you've never seen an Apple iPod or iTouch or your name is Rip Van Winkle. Hi Rip, long time no see! On the bottom of the unit are two slots for microSD cards and at the center is the micro USB jack for charging the Questyle QP1R. If you click any of my photos, you can see a higher resolution image that showcases the high precision and quality in manufacturing of the unit. As a longtime photog, it is great to see such fine craftsmanship. It also means there was very little Photoshopping needed to 'fix' any problems that were missed during QC at the Foxconn factory. The Questyle comes in a sturdy box that is magnetically kept shut. Included within the box are the QP1R unit, a standard micro USB to USB cable, 3.5mm to TosLink adapter, cleaning cloth and warranty booklet plus an owner's manual. The owner's manual smells like when I unbox a new pair of Nike or Adidas sneakers. No, really, it does. As for what that has to do with anything, I dunno, yet you rarely read about the scent of something within an audio equipment review; so there ya go. As for the overall styling, I love the gloss black on the front and black of the unit. It exudes elegance. 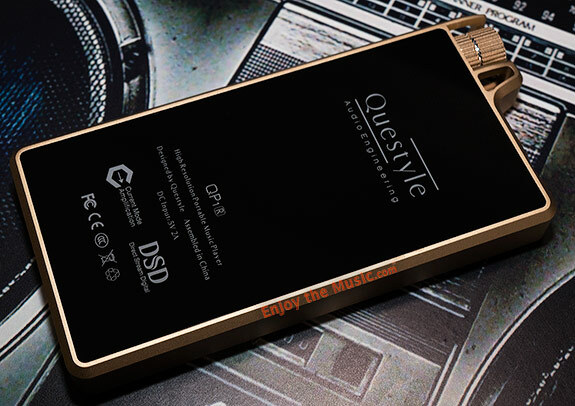 Questyle Audio Technology's QP1R main casing is CNC'ed out of aluminum and is available in Space Gray or Gold-like color, yet not true gold or rose gold. My listening notes below are with the incredibly resolute, high definition Noble Kaiser 10 with Double Helix Symbiote SP 8 silver IEM cable. I did use the Audeze LCD-3 Steampunk Edition and OPPO PM-3 planar magnetic headphones plus other CIEMs. So how does the Questyle QP1R sound? Am glad you asked, because what is a review without listening notes? At first it sounded a bit bright and sharp, yet 120 hours of burn-in and things became nicely balanced. So with over 120 hours of use and digging right in, I chose FLAC files ranging from the typical 16-bit/44.1kHz and higher plus those encoded with Sony's proprietary DSD format. First up is Donald Fagen's loveable album Nightfly. 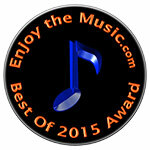 Voices within the song "Maxine" have excellent multi-track vocal delineation and resolution. The inner resolution is outstanding! Each layer is extraordinarily well-defined and has its own acoustic space within the mix. Bass is powerful, strong and driving. The driving force is, once again, due to the way the Questyle QP1R 'pushes' the rhythm forward. It is as if there is a microsecond advance within the leading edge of the instruments structure when it is to be resolved and reproduced within the music's intricate fabric. There was never the slightest hint of stress or strain in the bass. On the song "New Frontier" there is a newfound toe-tapping dance that gets my head bobbing with the music. Questyle's QP1R is triumphant at keeping all the musical bits in proper order and resolved clearly and cleanly. Questyle's QP1R killed it in the groove department. While it might not be the very best of the best in microdynamics, it gets very close with any CIEM I used. It is impressive at delivering all the small details and keeping the notes and vocals hanging there until the very end. With only 130 hours on her at this stage, I have a feeling another 130 could be the trick needed to get some more micro dynamic release as notes fade in volume into a dark background. Speaking of which, there is not a hint of hiss or background noise, which gives the music a clean window to shine through. This pushing of the rhythm is a blessing for those of us who enjoy dance, EDM, deep funk and the like. There's an excellent driving force behind the tunes, which results in a supportive groove versus cool 'n' casual relaxed presentation. If you live for rock, prog-jazz, EDM, dance, pop, etc then the Questyle will keep you movin' and shakin' all night long and into the next morning. If you're into soft rock, slow classical or other mellow genres of music, you might get a feeling of being slightly forward versus the music flowing softly and gently around you. This same pushing is also evident with the JH Audio Roxanne (bass adjustment set to zero), yet due to their lower resolution it is a bit more challenging to hear yet is still there to a less obvious extent. The Audeze LCD-3 with Nordost Heimdall 2 headphone cables had a great balance of everything they're known for and the Questyle QP1R's internal amplifier shines through too. There's no need for an external amplifier with the Audeze LCD-3 unless you like really high volume output. As for those who love OPPO's excellent PM-3 planar magnetic headphones, strain-free ear-bleed levels are easily achievable with high output. In fact I stopped at volume level 50 of a possible 60, as hearing damage is not my thang yet if you want to kill it and suffer the consequences, then hey, your body your foolish choice. Am right now listening to Paul Simon's "50 Ways To Leave Your Lover", first with the Audeze and now with the OPPOs. Am baskin' in awe of the resolution and details of Steve Gadd's drum licks. Of course the vocals, tasty guitar, keyboard, and bass are remarkable too. Back to the Noble K10, the pushing forward of the rhythm seems to be more pronounced in the midrange, whereas the bass and treble seems to time sync in a normal fashion. Am listening to The Very Best Of The Eagles "The Long Run" and it is resolution, resolution, resolution. Yes, that is what my notes say three times in a row. Am impressed how much information the Questyle QP1R can deliver. If it is within the digitized audio file, you're going to hear it. In fact I feel the resolution beats all other players here, yet this resolution comes at a cost of a slight bit of dynamic shading. It is as if there is a compressor within the audio signal chain. Again, I am at around 130 hours of use (actually 160 hours during this editing) as am writing this review IRT (in real time). On the upside, am clearly hearing things that are normally more buried within the music. Some sounds within a recording are so buried within the mix that you might not consciously hear it. They are very subtle. Music can be like that. This is especially true with Pink Floyd; where there are things within the soundfield yet some of it registers more in your psyche. IMHO the Pink Floyd's Division Bell is one of those albums far more than Dark Side Of The Moon. Roger Water's epic album Amused To Death qualifies here, too, as most people have never fully realized all the Q Sound encoding that lifts instruments above the front soundscape, a spinning soundscape, and other tricks that can easily be reproduced by understanding human hearing and then manipulating it via time, phase and other 'tricks' in the mastering stage of the album. Sadly, many of these tricks encoded for a home audio system are completely lost with headphones and IEMs. They are also a bit lost with home listening rooms that have less than ideal control of sound reflections off of walls, ceiling, furniture, etc. For it is when I had the live-end dead-end (LEDE) audio production experimental room where everything becomes properly rendered as it reaches the eardrums. Speaking of Q Sound, moving to Madonna's Immaculate Collection, am impressed by how clean and clear everything sounds with the Noble K10 with Double Helix Symbiote SP 8 silver cable. Again, the music has a glorious drive that nearly commands one to get up and dance. With the JH Audio Roxanne CIEMs, which I'm listening to right now, there is slightly less rhythmic driving force. Then again I'm kinda an old fart kid of the 1980's, whereas if I substituted Darube "Sandstorm" or, in my wife's case, anything by Pitbull, the same comments about the music's drive via the Noble K10 setup nearly commands you to get up and dance would be equally valid. Music is such a personal thing. One man's trash is another man's treasure and all that. As for the frequency response and rendering, the highs are very impressive as is the bass. There seems to be a small up-tilt within the 4 to 5 kHz zone. On the Noble setup I feel that the harmonics and overall presentation is far smoother than with the JH Audio Roxannes. For the remainder of my listening impressions am using the Noble K10 setup, as there is something a bit amiss going on and my ears seem to fatigue just a touch with the Roxannes. During the next firmware update, Questyle plans to add an equalizer and that could greatly help to customize the sound depending on which IEM or headphone/cable setup you choose to use. With the current QP1R Beta firmware and Noble K10, the sound is very balanced frequency-wise top to bottom. It is impressive! Not just in width, as the depth and how each instrument and vocal is clearly placed within the soundscape is inspiring. Everything is solid and defined within their acoustic position. In fact when there is brief reverb, or hall, expansion within the front soundscape can cleanly be heard. Naturally recorded music benefits greatly here! During recording studio contrived soundspace, have never heard a battery powered portable audio unit that betters the Questyle QP1R at so cleanly delivering this well-defined and solid image width with accompanying 'hall sound' (or contrived, recording studio effects-laden manipulated aural space). Madonna's song "Vogue" is richly mixed with Q Sound effects and thus filled with such examples; provided that your sound system, be it home or portable, is up to the task of course. Other than, and perhaps better than my old LEDE experimental room, have never heard this song so well resolved with all the effects clearly intact. Some audiophiles might live for that breathe from a jazz singer, small violin cues within an orchestra or what-have-you, yet my faves are all those plus how an audio track has the ability to manipulate the human hearing and organic (human) decoding system to achieve a specific sonic impression / result. Some manipulations of the human hearing system are fairly easy; with others being quite challenging. The Questyle QP1R gets my highest marks to date for its ability to deliver incredible resolution in purposeful manipulation of the human hearing system when it is within the music. This includes natural, minimally-mic'ed recordings that are so prized by audiophiles for delivering an aural awareness of acoustic space, with their natural time, phase, etc encoded within the music (usually by using only a pair of properly placed microphones). Ok, for all you bassheads out there, you're gonna love the Questyle QP1R. Clean, solid, and deep. Killer quad bass for you old school types. 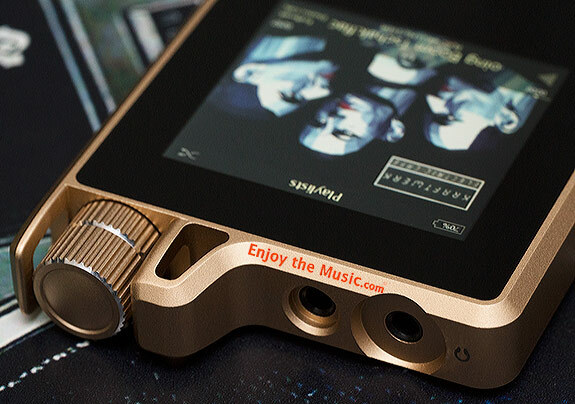 Perhaps not quite to the Rock Of Gibraltar level of the Astell&Kern AK380 yet am now at the 160 hour mark and without an equalizer, which will be added to the next firmware. Speaking of firmware, the Questyle QP1R here is on firmware S/W 0.07Beta, with hardware version being 3.0. Deep bass is clean, fast and highly resolved. Not that flabby mush-like mashed potatoes sound. For technical geeks out there, it is akin to the difference in a low (slow and dragging) versus high damping factor (fast and well-controlled). Getting back to the bass and internal amplification, there is an abundance of precise drive and power that it easily drives all my CIEMS (JH Audio Roxanne and 13 Pro, Noble K10, and Ultimate Ears UE18 Pro) without the low output ever reaching over 45 during the most ear-bleeding moments. Note that during the next firmware update this setting will change a bit. Generally, I tended to keep it at a volume level of around 27 for normal listening with the Noble K10 and 35 for the JH Audio Roxanne. Keep in mind the volume goes up to 60, and dare not go anywhere near that in low output mode using IEMs as am sure either hearing damage or destruction of your IEMs will occur. With high output level, even the most challenging headphones here such as the Audeze LCD-3 Steampunk Edition are driven with ease to output that is more than satisfying. Thus I see no reason to use an external amplifier as many do with other devices, unless of course you find that some other amplifier does some characterizations you like to the music of want those inefficient Audeze headphones to reach ludicrous volume. Amplification and drive within the Questyle QP1R is plenty powerful and thus could save you money from 'needing' an external amplification unit. Questyle's QP1R is a solid contender for the best in resolution; especially for a unit that does not use balanced circuitry. While microdynamics fall a tad bit short, the overall dynamic ability with fast control and clean delivery is outstanding! There is no doubt the hardware and user interface is one of the very best at this price range. 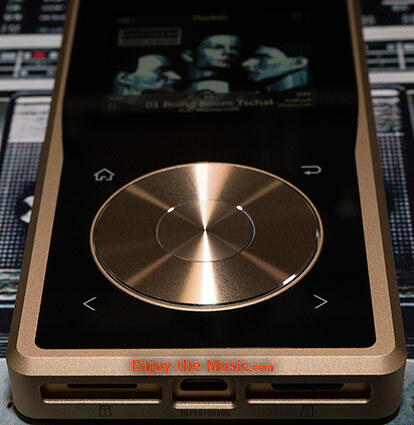 If you love music with driving rhythm and musical pyrotechnics then the Questyle QP1R is an excellent choice. Coming from an incredibly black background, the music freely floats and is placed solidly within the soundscape. Audible cues that might be missed, or are less noticeable with other battery powered portable players, are easily resolved. Harmonically, I'd say the Questyle QP1R is on the more accurate side of things versus editorialized and altered into being on the slightly lush and warm side of life (I'm looking at you Sony NW-ZX2). Can't help but keep going back to my notes that continuously say "resolution"; and here we have output to your ears what is put in from the original digital audio file. Fast, clean, and without electrical hang-time distortion. Electrically, call it a high damping factor and I bet if someone measures the impulse rise / fall time it would be exceedingly fast. If I was a dance, pop, or dubstep DJ seeking the best portable audio device to play music that gets the crowd dancing, the Questyle QP1R is the best unit I've heard to fulfill this goal. Classical, jazz, rock, and easy listening are also excellent and have been enjoying many hours of those genres with the QP1R. There is a delightful driving force in the way music is reproduced that gets your toes a-tapping. Classical music lovers who love minimally-mic'ed recordings will bask within the music and, especially, the enveloping hall sound. If you love the sound of echoey churches, small chamber, and the best performance halls, the Questyle QP1R magnificently unravels these aural cues with ease. 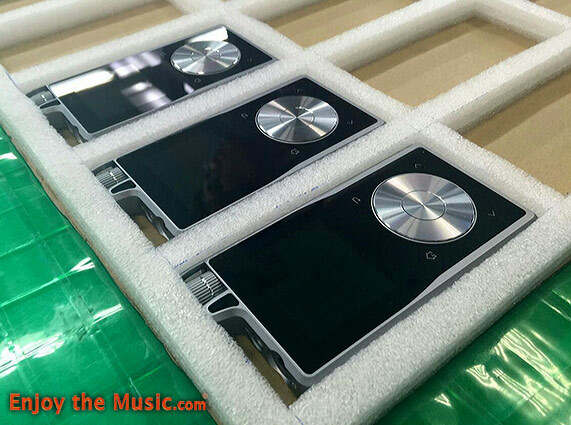 So the $1,000,000 question is how does the Questyle QP1R compare to the Astell&Kern AK380. Since the AK380 is not here I can only report on sonics, as it is hard to detail the output power difference as for how the QP1R drives the Audeze LCD-3. With the Noble K10 the stereo separation is equal as I recall. This begs the question of you really need balanced output. Heresy you say? Well then you need to listen to the QP1R and then you can feel free to send me hate e-mail. Overall dynamics and 'jump factor' are about the same too. The AK380 has one card slot and 256GB of internal memory whereas the QP1R has 32GB and two card slots, so potentially the QP1R for the win here plus being more card-based means you can easily move all your music from one device to another versus being stored only within the device. As far as resolution goes, the next time I get my hands on an AK380 will know more, yet it has to be darn close between the AK380 and QP1R. Touchscreen gets the nod for the AK380, familiar wheel and click for the QP1R so it may boil down to a personal preference here. Touchscreen does have the potential to be faster if you have many files to flick / pick to versus lots of scroll wheel action. Then again we must remember we're talking $899 for the QP1R versus $3500 for the AK380 so you're paying for that touchscreen. Manufacturers have some tough choices to make, and here Questyle felt it was better to invest in the sound quality of the unit versus touchscreen operation. Perhaps that alone says it all about how impressive the QP1R is when it all boils down to sound quality and the ability to drive everything from IEMs to power hungry headphones. With a very familiar, easy to use GUI controlled by the rotating wheel and a few well-organized buttons and touch-sensitive bits, you'll feel right at home using the Questyle QP1R in a matter of moments. For you drummers out there, am right now listening to Paul Simon's "50 Ways To Leave Your Lover" and the way Steve Gadd's drumming, and drums with tambourine sound, is mind-boggling mesmerizing! I'm in love with the sound of the Questyle QP1R and Noble K10 with Double Helix Symbiote SP 8 silver cable combo. Visually, in Space Gray or Gold (as reviewed) looks the part too. If Questyle decides to offer a Limited Edition version in rose gold I'll be the guy at the very front of the line with cash in hand. Questyle's QP1R is a killer unit with mind-blowing sound wrapped in high style chic magnificence. 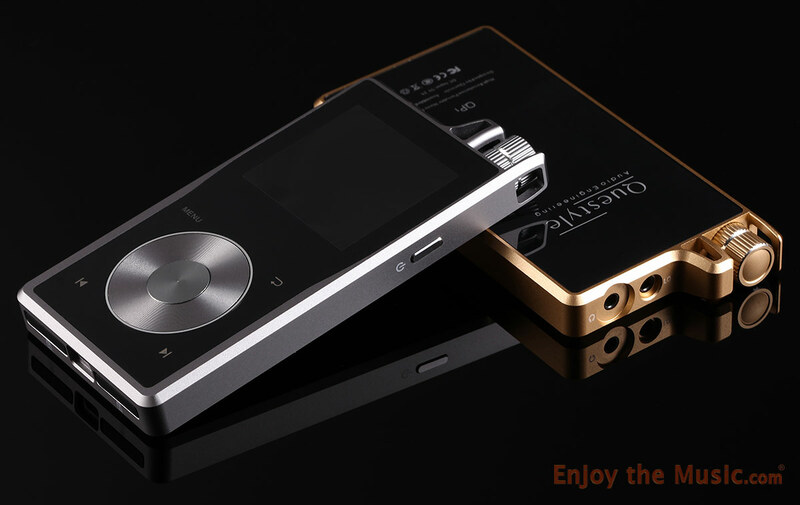 Type: Portable audio player capable of up to 24-bit/192kHz and DSD 128. QP1R uses higher quality components as well as a more critical approach to the audio circuit, producing lower distortion than the QP1. The QP1R also employs a different PCBA, a larger internal storage chip (32GB versus 16GB), different version of software, and adds two hours' of playback time for a total of ~10 hours per change with high resolution audio files. Amplification: Current Mode Amplification (patented), all discrete components. Pure Class A circuitry.